Here is another terrific product I purchased at Marys Bargain Cycle before our Rhode Island trip: The Kuryakyn Swingwing pegs part# 4466. As a rider with mid mount controls I occasionally feel my legs stiffen and need to momentarily stretch them out. Two seconds of useing my cruise pegs does wonders for my circulation and knees. I notice a lot of riders use their highway pegs extensively. So what is a passenger to do? They have to ride for miles with no alternative foot positions, especially if you are riding a bike with pegs. 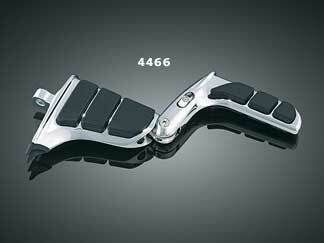 I was going to buy the Harley Davidson Dyna passenger footboard mount kit for $199.95 (footboards NOT included) so that Diana could move her feet around a bit more than the pegs allow, but then I saw these Kuryakyn Swingwing pegs. I bought them for $159.99 at Mary’s in the New Castle Farmers Market. Diana loves them! The Swingwings were not designed as a passenger peg. They are designed to be an inexpensive alternative to a forward control conversion for those of us with mid mount foot controls. The swings give you a set of 3″ forward cruise pegs. In the closed position they are like a mini floorboard with very thick rubber cushion that can be replaced when worn out. For highway cruising you can swing out the wings for two additional foot positions. The passenger can use the inner pegs, the forward highway pegs or bridge her feet diagnally across from the inner to the outer pegs. Diana was very appreciative of the added comfort. Installation was simple and Diana was more than willing to assist since this addition was meant for her comfort. She says that in the folded up position they look like chrome staple guns. Folded down they look like jet airplane wings.